Wikipedia suggests that ‘Nudge Theory’ “proposes positive reinforcement and indirect suggestions as ways to influence the behaviour and decision making of groups or individuals”. The problem seems to be that the reinforcement can work in any of a number of directions and some are surely not healthy. Increasingly our experiences are mediated by the groups, teams, communities and associations we share. And, also increasingly, these groupings are online. Recent experience in the polity of the USA and the UK (among others) indicates that groups of all kinds are being nudged in directions which may well not be healthy for wider society or even the sustainability of the groups in question. At the Bayswater Institute we have a profound respect for groups and associations of all kinds and, deriving our inspiration from the work of Harold Bridger working at an earlier time of world hazard (the 1940s) we have developed ways for groups of all kinds to achieve wisdom in groups. Wisdom in Groups, making use of Bridger’s ‘Double Task’, encourages groups to become GroupAware. I live in M-World. You live in M-World too. In my M-World I don’t exist. In your M-World I exist but you don’t. In your M-World you don’t exist. I don’t meet me in my M-World and you don’t meet you in your M-World. But I meet you all the time and you regularly bump into me too. We are strangers to ourselves in our M-Worlds. That is just the way of it. When you and I are at our best with each other we leave our M-Worlds and come together for a while, we meet in another place. Let’s call it S-World. S-World is very, very similar to M-World. It is really, really close, closer than the hundredth of the width of a butterfly’s wing. You could not put a piece of paper between M-World and S-World. But they are so very, very different and they occupy very different places – they are an infinity apart. In M-World I am isolated, my perspective is stranded to itself, my thoughts are my own and my journey is the journey of the solitary. But, when we meet in S-World I am part of a community, my perspective is confronted and completed by yours and others, my thoughts are shared, and my journey is not so lonely. The problem seems to be that S-World is hard to find. But is it? Oddly people who need each other find each other effortlessly in S-World. All M-World separation disappears, the needy are united in an instant. When the need is great, in an instant they are all moved to and share in S-World. But people, even really, really clever and talented people who do not want to need each other can never find S-World, not even if they are all together in the same room, sitting right next to each other for hours and hours and hours, looking right at each other. They remain in their M-Worlds where they do not even meet themselves. In a fractured world where it seems that people are pulling further and further apart, where we find it hard to understand each other and where conflict seems likely to break out at any moment, we present Wisdom in Groups. Wisdom in Groups from the Bayswater Institute. You can think of the Wisdom in Groups event as a ‘headspace’, where beliefs and assumptions are renewed and refreshed. Uniquely, Wisdom in Groups contains and implements the Double Task approach development originally by Harold Bridger. Double Task provides clarity both about the work we do and the way we do it. The outcome of applying Double Task is what the Bayswater Institute refers to as ‘Group Aware’. A person who is GroupAware is more reflective and more capable, better able to manage the overt and covert challenges of life. Wisdom in Groups is intended to help people to feel stronger and more resilient. It can mark a step change in our understanding of ourselves as leaders. In all the turmoil of the contemporary world, maybe to be truly GroupAware is the most powerful gift that an organisation can provide to its people. Peter Drucker came up with a saying ‘culture eats strategy for breakfast’ and we see this in many of the organisations we at the Bayswater Institute go into. Using Double Task with leaders and teams helps us to work together on strategy and culture at the same time, so that changes, introduced are firmly rooted in the reality of the present, and lead to better outcomes in the future. The adoption of new technologies and innovation in the NHS is a challenge, with many barriers along the way from early stage development to full scale implementation and delivery of all of the potential benefits. The BI were commissioned by the NHS Innovation Accelerator (NIA) in March 2018 to undertake a rapid study focused on improving our understanding of the organisational processes involved in adopting innovative developments. A report on this work has now been published providing new insights into how decisions are made within NHS organisations. The approach we adopted included an examination of eight theoretical perspectives in the literature on innovation adoption. These were then used to guide our interview questions as well as providing a lens through which we analysed the data gathered from the interviews. 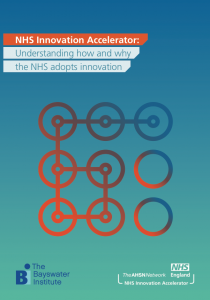 In capturing these real-world case-studies we have gained new insights into how the organisational context plays a significant part in adoption and we highlight in the report a number of recurrent themes relating to the effective spread of innovation across the NHS. common tasks in the adoption journey. Some of the key themes emerging from our work include: the complex nature of adoption; the dynamic and non-linear process of adoption within organisations; the need for mutual adaption and iteration between the organisational context and the innovation to facilitate adoption; the facilitating role of multiple champions operating inside and outside the adopting organization; and the interplay of push and pull factors that supports implementation and builds the capabilities of both the adopting organisation and the innovator.